Over the last few decades Fergus Falls has seen tremendous growth. This is no surprise given the quality of life the city offers to the residents. The scenery in the area is spectacular; the Union Avenue Bridge majestically spans over the Otter Tail River. Just below the picturesque River Walk follows the river. Architecture around downtown dates back to the late 1800s. The spectacular Fergus Falls landscape coupled with its growing real estate industry and reasonable prices makes it a great place to buy a home. Great schools, walkable neighborhoods, recreation, culture, lakes and scenic drives makes the city an ideal place to live. If you are thinking about moving here, or just reconnecting with the area, you should know there are also great things to do in and around town. Here are ten of our favorites. Fergus Falls is home to two great nonprofits that support artists and artistic programs, Springboard for the Arts and the Lake Region Arts Council. Among various art studios downtown sits Kaddatz Galleries, a showcase of a talented community. Also downtown, A Center for the Arts, in residence in a remodeled 1921 theater, provides year-round programming, including local and touring performers and showcases music, theatre, dance and more. The auditorium is also available for rent. It has been used for everything from business meetings to birthday parties, memorial services to private movie screenings. Welcome flags and fresh flowers pots in the summer, hokey Christmas decorations and lights in the winter are set against an amazing architectural backdrop of buildings from the early 1900s on Lincoln Avenue. This main drag through downtown Fergus Falls is home to a mix of long standing businesses (check out Victor Lundeens, a print shop, book and gift store circa 1914) and unique shops and eateries. The museum at the Otter Tail County Historical Society is a great place for new residents to gain insight into the early days of Otter Tail County. It’s fun for kids too. They have a seek and find game as you follow the path through the wildlife area, replicas of a kitchen, bedroom, living room, one room school, church and an early settler cabin you can walk through. The path continues displaying farm life, logging, and a blacksmith shop before you walk into a display of store fronts of a much earlier time. The small entrance fee is well worth the investment. Prairie Wetlands Learning Center is open to the public for walks through indigenous wildflowers and prairie grasses and has a wonderful education-based store. But the center’s main focus is hosting hundreds of school children a year in a wonderful science curriculum, under the direction of the U.S. Fish and Wildlife Service. 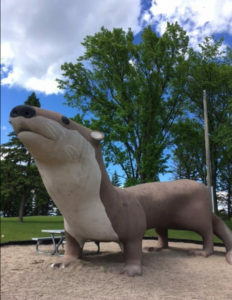 You have to check out the town’s famous roadside attraction, a giant otter sculpture overlooking Grotto Lake in Adams park. Otto is the most photographed cement mammal around! We love the upbeat family friendly atmosphere at I-94 Speedway, where small town hospitality meets big time racing competition. The dirt track is always in excellent condition and the race cars come from far and wide. The staff runs the races efficiently and there’s a candy toss for kids during intermission. Concessions aren’t fancy, but you can enjoy an affordable supper and an adult beverage while cheering on the drivers. Bring a blanket to sit on and extra layers to stay warm when the sun goes down. The Otter Tail river flows through town, creating the “falls” part of the town name. 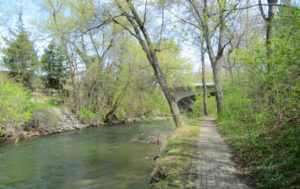 One of the best hidden secrets is a scenic River Walk, a walking trail that follows the river all the way through town. Some parts include a bike path too. Fergus Falls is a jumping off point for the Otter Trail Scenic Byway, a 150-mile loop through rolling hills, farmland, a state park and rich tradition. The trail winds past 1,000 lakes, an ancient flour mill and other cultural stops. With over 3000 lakes in the region, there are a few right in town, so you are never far from fishing, boating or just enjoying the scenery. One favorite on the edge of Fergus Falls is Delagoon municipal park. Not only does the park feature water recreation on Pebble Lake and ample green space for picnicking or walking the dog, it also features baseball diamonds, camping and is the start of the 55-mile Central Lakes Trail, a walking and biking trail during the summer, and snowmobiling trail during the winter. Also, Pebble Lake Golf Course is just down the road. Our conclusion- we love it! Tree lined streets and neighborhoods with homes in all price ranges surround these great town features. 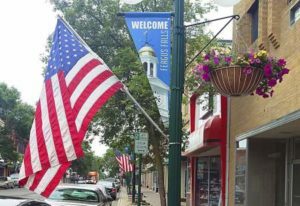 With festivals and fun activities all year long, it’s no wonder there is so much town pride in Fergus Falls. Fergus Falls’ schools are renowned for their quality of education and excellent learning environments. The area features six elementary schools; the Adams Elementary, Cleveland Elementary, McKinley Elementary, Our Lady of Victory School, and Trinity Lutheran Elementary. Adams Elementary and Cleveland Elementary are the top-rated elementary schools in the area. Fergus Falls also features top secondary schools; Kennedy High School and Hillcrest Lutheran Academy. Kennedy High School is famous for its athletic team “The Otters” and school colors are maroon and gold. At the college level, there is the Minnesota State Community and Technical College and the Lutheran Brethren Seminary. Hungry? We regularly update our review of Best Fergus Falls Restaurants in our Lifestyle Blog. Check it out for the most scrumptious breakfast, lunch and dinner in town! Have a dining suggestion? Drop us a line! On average there are 194 sunny days in Fergus Falls. July is the hottest month recording highs of 81 degrees, and January is the coldest with temperatures often dropping below freezing point. The rainfall is about 25 inches annually, which below the national average of 39. However, there are only 49 days with measurable precipitation throughout the year. Property in Fergus Falls has something for everyone when it comes to real estate listings. You’ll find affordable condos and townhomes, and single-family homes from simple and affordable to luxurious on the river, lake or golf course. Want to live rural? 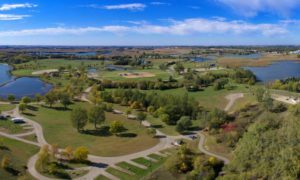 There are several communities within easy commuting distance to Fergus Falls, as well as farm dwellings with acreage. This area has seen notable growth in new home construction over the last several years. Given the amenities located in this area, the growth in the real estate market is expected to continue.